Here we will cover the basics of the science of light in the context of engineering the electric light. These basics are good for creating a foundation for our video series. The goal of engineers working on the electric lamp is to create light using available AC or DC power, but what is light in the first place? Light comes from particles called photons, and photons are released from electrons which surround an atom. Each electron around an atom contains a different level of energy. Electrons orbit the nucleus of an atom the way the earth rotates around the sun. An orbit pattern (called an “orbital”) which is more distant from the nucleus has more energy. You can increase the energy of the electrons by bombarding the atom with particles, this is called exciting the atom. This will change the orbital for a short instant. The orbital will grow outward, then return inward again. When the orbital returns inward, it will emit a light photon. Pioneers of lighting technology often had to find new ways to excite atoms. Light comes in different colors, the color is determined by wavelength, and the wavelength is determined by how much energy a photon has. If an electron is in a more “powerful” orbital, and it shrinks to a lower orbital, it will emit a photon with more energy and higher wavelength. We measure wavelength by using frequency (Hertz) or wavelength in meters. See diagram below. When dealing with lamps we can measure color using Color Temperature which uses degrees in Kelvin. 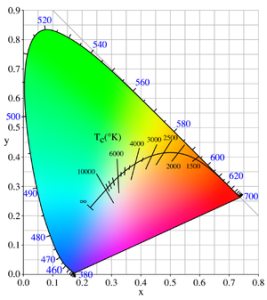 Color temperature is extremely important in analyzing the performance of your electric lamp. Lower color temperatures rated 1000 K – 3000 K are considered “warm”. 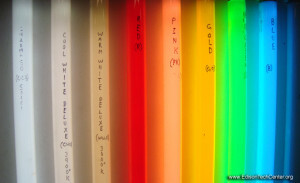 Cool or whiter light is found from 3000 K – 10,000 K. Most incandescent lamps have a color temperature around 3000 K.
An engineer must design his/her lamp to work at a color temperature which is ideal for the use of the light. Most people prefer warmer color temperatures of the incandescent light in their home. At work places a cooler or whiter light is usually preferred since it is less likely to induce sleepiness or comfort. A light’s ability to accurately show color is rated by the CRI or Color Rendering Index. You can compare CRI between two different lamps as long as you are dealing with given color temperature like 4000 Kelvin for example. A CRI of 100 is the best, in other words the human eye can tell the difference between all colors of objects you see under that light with the maximum accuracy. A high pressure sodium lamp which is usually used in street lighting, it is difficult to see the difference between a dark red car and a black car under this lamp. The gases, elements and materials you use in a lamp, along with their unique properties will limit your performance. Sodium Lamps, first developed in 1920s-30s provided great energy efficiency and large light output, however the yellowish color (1800-2700 K) and limited spectrum that it emits makes everything monochromatic. It is not so important for a good CRI in streetlights or general yard lighting, however factory lighting is usually Mercury Vapor, Halogen, Metal Halide, or Fluorescent (4000+ K). Lumen – Measures the total amount of visible light emitted by the light source. Visible light is a key term since Lumens are used in applications where the human perception of light is important, like in most uses of the electric lamp. 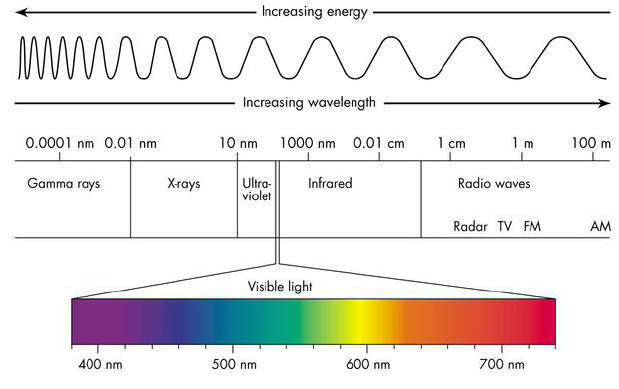 The human eye does not see all frequencies of light with the same intensity, therefore when measuring lumens you are not simply measuring the energy of all wavelengths emitted by the light source. The human eye happens to see the green spectrum with the most intensity. Lumens per Watt – How well a light source converts energy into visible light. This is very important for measuring efficiency of a light type. Lumens per watt (lm/W) ratings will vary even within one light type due to materials used and slight design differences. Lumens per Watt ratings on light packaging is almost always wrong. Companies test products in ideal circumstances, not in the average home or work setting. They also may not take into account inefficiencies created by the aging of the ballast materials. The common CFL typically never lasts the full life on the box due to electronic ballast failure, not because of the light source failure. Candlepower– The older unit in which they measured the intensity of light emitted from a source using the standard of a candle of a certain type, size, and weight. Over the years scientific institutions tried to make it more precise by changing the standard to a lightbulb type and later a blackbody at the freezing point of liquid platinum. Now we use lumens. Candela – Another term for rating light intensity created in 1948. 1 candela is = 0.981 candlepower. Lamps can fail due to the way it makes light or the exterior apparatus that helps run the lamp (like a ballast). LEDs have reliability problems in outdoor settings because of extreme temperature variations in the environment, this is because semiconductors in the design are sensitive to heat. Or If a cooling fan (mechanical failure) on a large LED fails, it may result in the overheating and destruction of the device. Neon signs may have trouble keeping hot enough to keep the arc going in cold weather, the result is a flickering. Fluorescent lights can be very reliable if the ballast is build solid, however many companies today use cheap, light materials in ballast design to save on cost and make the product fail prematurely. This is done to sell more lamps. If you look at early General Electric and Philips fluorescents from the 1940s the ballasts were made with a lot of copper and heavy materials. Many of these lamps are still in operation today in older facilities.